The 1998 World Cup final went down as one of the greatest days in French history as they won their first World Cup over a Brazil side containing legends such as Rivaldo, Cafu, Roberto Carlos and an (famously unwell) Ronaldo. The French team had their own players of similar stature too with the likes of Marcel Desailly, Lilian Thuram and eventual man-of-the-match Zinadine Zidane. France lined up in a 4-3-2-1 formation with Zidane and Djorkaeff acting just off of Guivarc’h. Barthez was the goalkeeper protected by a strong back four of Desailly, LeBoeuf, Thuram and Lizarazu. Didier Deschamps was the deepest midfielder and had Petit and Karembeu to his left and right respectively. In the attack, the above mentioned Zidane and Djorkaeff threatened in a triangle led by Guivarc’h. Brazil took on a rough 4-2-2-2 formation with two deep midfielders flanked by some highly-positioned wide men. Claudio Taffarel was Barthez’ opposite behind centre-back pairing Baiano and Aldair who were flanked by one of the best full-back duos of the era in Roberto Carlos and Cafu. Dunga and Sampaio were positioned deep as pivots whilst ahead of them attacked Rivaldo and Leonardo on the flanks. The two strikers were Ronaldo and Bebeto, though the former dropped quite frequently off of the ball. One of the key aspects in France’s win over such a strong side was their defensive performance as they held Brazil to minimal chances throughout. They used quite a flexible structure which was roughly a 4-3-3 in pressing, with numerous variations between the front ‘3’ whilst in deeper positions they would generally take on a 4-3-2-1 which itself could adapt due to man-orientations. During Brazil’s construction, France used the front 3 to force the ball away from the centre and towards the full-backs who, despite being individually brilliant higher up the pitch, were under pressure to develop possession in its initial stages. There was a particular focus on Dunga who saw the majority of the ball during Brazil’s construction phase. Although there wasn’t any particular man-marking on the Brazilian playmaker, France did increase the pressure to stop him moving the ball through the middle. For the most part of the game, he was limited to relatively harmless horizontal circulation as well as some long diagonals which could be coped with defensively. Without Dunga’s influence, Brazil struggled to move the ball into dangerous areas as they couldn’t call upon the other midfielder, Sampaio, to fill the gap left by their captain. The central midfielder rarely influenced possession further than simple passes and in many cases his positioning restricted him from being accessed initially. In some cases, the French defensive block contained no staggering at all and was purely a 4-3-3 in 3 straight lines. This could’ve potentially been an issue and Brazilian did threaten to penetrate the lines at times. Without staggering, particularly through the midfield, France had a few moments of instability as they weren’t compact enough to counteract this structural issue. On the other hand, adaption of the front 3 whilst some interesting positioning of the midfield line allowed France to generally have a good level of spacing throughout the defence. Commonly, Zidane and Djorkaeff would drop to form a 4-3-2-1 which would help them hold greater control over the central passing lanes. 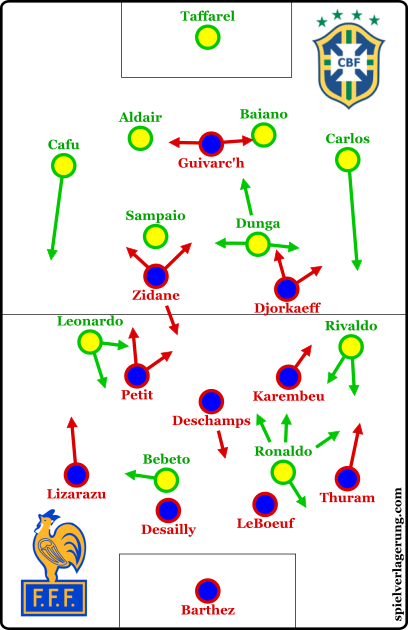 In one particularly interesting case, Zidane dropped alone into a 4-3-1-2 whilst Dunga had the ball in the Brazil defensive line. With a small opening available between Guivarc’h and Djorkaeff, a pass was attempted to Sampaio but Zidane cleverly executed a pressing trap to regain the ball and start a counter. Down the right side of France’s defensive block, there were some particular man-orientations to counter the individual threats of Brazil. Both Karembeu and Thuram worked well together to contain Rivaldo and would rarely give him any time or space by the touchline. Similarly, man-orientations through the midfield were used to prevent Brazil from finding Ronaldo when he dropped towards the centre of the pitch. Upon regaining the ball, France looked to threaten instantly as they counter-attacked through the middle of the pitch. Zidane and Djorkaeff would either make aggressive movements upfield through their respective half-spaces, looking to find a ball in the channel (which could theoretically create a 1v1 due to the high full-backs). On many occasions however these were the players driving with the ball (Zidane particularly) as they would then directly attack the Brazilian defensive line. On many of these counters, France failed to establish effective combinations and as a result, struggled to move the ball into a dangerous position. This led to a few of these opportunities breaking down after a misplaced pass or, equally as common, a case of poor shot selection causing little test for Taffarel. It was interesting to see, considering how advanced Cafu and Roberto Carlos were, France’s decision to break through the centre. It almost certainly was a matter of formation, as they possessed strong counter-attacking threat with the players positioned down the middle. Upon turning over the ball, Brazil had open spaces on either flank which most teams would’ve oriented their counters around. Yet France maintained this central focus, whether it be from their starting positions or possibly an acknowledgement of the stronger position they would hold. Despite such excellent individuals across the attack, Brazil didn’t often threaten the French goal. They were hindered greatly by some flaws on a collective-level which took the bite out of their otherwise strong attack. Perhaps the most glaring issue of Brazil’s attacking organisation was their inability to space themselves correctly. This was both across the whole 10 outfield players as well as between the attackers themselves. 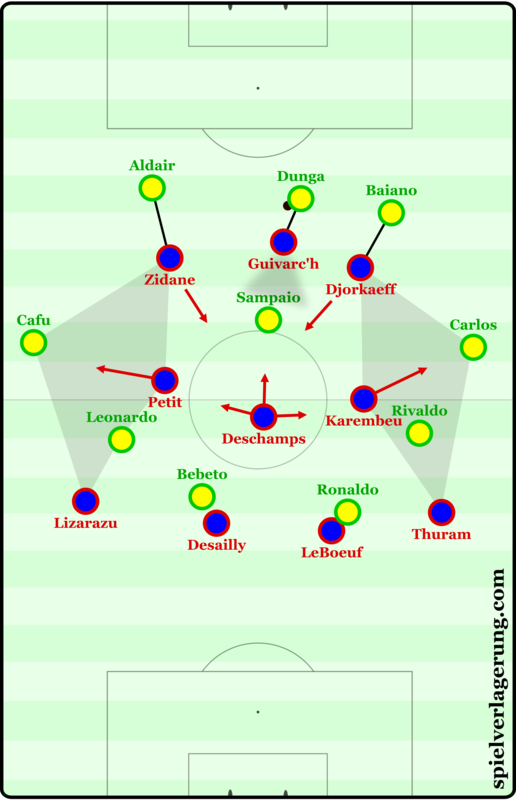 Despite the attempts of mainly Rivaldo and Ronaldo who dropped down the left, there was a vertical disconnection between the deeper players in build-up and the attack. 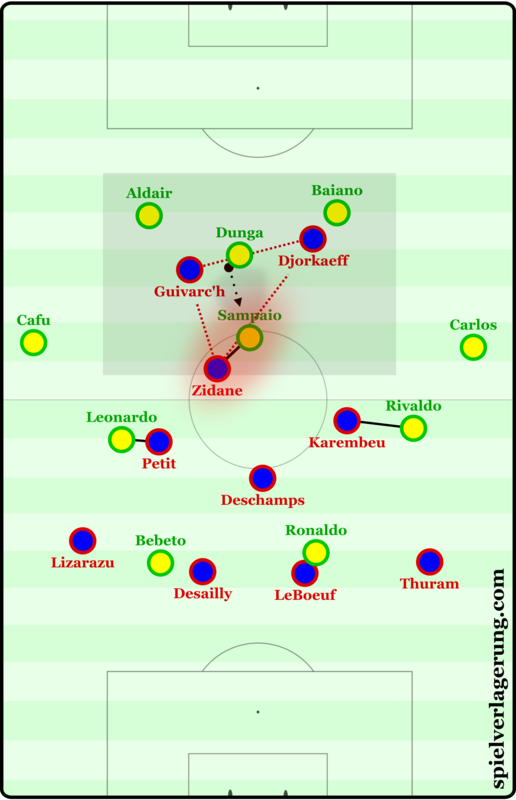 Sampaio offered little means to connect the side through the middle whilst France made matters worse through their defensive organisation. Aside from this, there was generally a weak spacing across the front 4 alongside the full-backs and situationally a CM. A number of times they were too stretched across the width of the pitch which restricted them from acting with one another. Not only did these mean for the majority of attacks being isolated and on an individual level, but Brazil’s circulation was often forced to weaker areas as France could control the centre with relative ease. With some of their strongest players on the wings, Brazil were quite focused on attacking through the wider areas of the pitch. In doing so they were surprisingly ineffective however and failed to establish any threatening attacks through these situations. They were particularly dysfunctional down the right, where Leonardo rarely even made an attempt to integrate Cafu into the attack. With such an aggressive right-back, Leonardo would drift towards the right half-space yet he wouldn’t then bring him into the attack. His actions were generally individual with dribble attempts being made. Albeit a retrospective comment, I feel there would’ve been more potential had he acted more towards bringing his full-back into play. Throughout the match there were a few moments where small-scale combinations could’ve put the full-back in a dangerous position but were missed. This led to Cafu being largely isolated in attack which immediately limits the attacking variability a great deal. There was some cause for French panic as Marcel Desailly picked up a second yellow for a reckless challenge late on, though they managed to maintain a fairly strong defence. As what typically happens during these situations, Brazil became increasingly direct with a very aggressive shape which left them weaker on transition. France, now down to 10-men, sat deeper in a 4-4-1 shape and were fairly untroubled in deflecting the increasing Brazil pressure. Through rushing to find at least one goal, Brazil’s attacks were still ineffective and poorly orchestrated. This allowed France’s defence, despite the intense pressure, to still keep them at bay until they rounded off the victory with a late third. Looking in retrospect(I was quite young at the time), this was one the most wasted Brazilian teams, despite having made it to the WC Final. There was a staggering amount of talent on this 1998 WC Squad, and a lot of other great players were left out. But management was very poor, Zagallo was in his final years as a coach and probably had lost interest in the minutiae of the job. A lot of his choices were questionable at the moment he made them, and became worse with time: Zé Carlos as a reserve right-back(he had an obscure career besides a brief moment in 1998), Júnior Baiano as the other CB, even though Mauro Galvão was giving classes on how to be a CB on a weekly basis in Brazil, cutting Flávio Conceição because of a minor injury…Well, he’s a legend, and he was the manager of what was probably the greatest team in football’s history(Brazil 1970), but by 1998, he was living of his reputation, and he probably cost us the chance of being more competitive in the final.